In this book, Roberto Unger brings together his work in legal and social theory, and argues for the reconstruction of legal analysis as a discipline of institutional imagination. 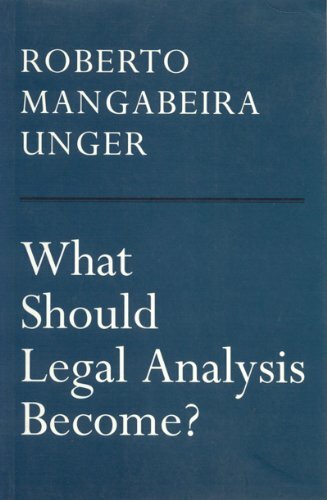 Roberto Mangabeira Unger is one of the leading social and political thinkers in the world today. He is also active in Brazilian politics. Verso has published much of his work: False Necessity: Antinecessitarian Social Theory in the Service of Radical Democracy , What Should Legal Analysis Become? , Democracy Realized: The Progressive Alternative , Politics , and The Left Alternative .